Named By: Arthur Smith Woodward - 1889. Classification: Chordata, Actinopterygii, Pachycormiformes, Pachycormidae. 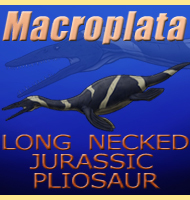 Size: Estimates vary but the larger specimens may have approached up to 16 meters long. Known locations: England, France, Germany, Chile. 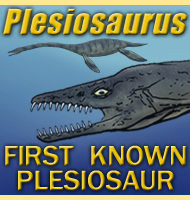 Fossil representation: Many specimens of over 70 individuals are known. 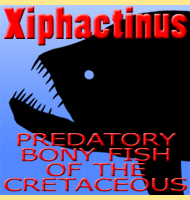 The secret to the large size of Leedsichthys is probably down to its lifestyle as a filter feeder. This method of feeding requires very littler effort other than opening the mouth and cruising near the surface of the water. 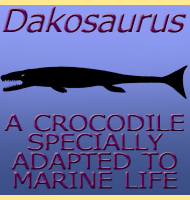 Such a method of feeding requires only a slow metabolism as it is not actively hunting for prey. 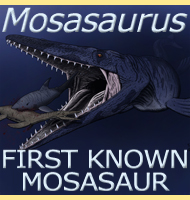 Its large size however may mean that it was possibly gigantothermic like many of the large fish we know today. Because of the fragmentary nature of recovered remains, the exact size has been open to much speculation. 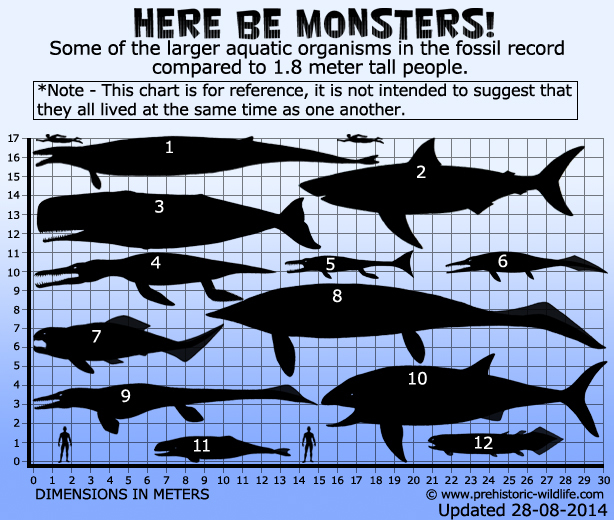 Most researchers agree that a size of nine to ten meters long is realistic, but also recognise isolated remains that are larger than they appear in more complete specimens. This in turn has pushed the maximum estimate to a potential sixteen meters long. In contrast, the largest living fish today is the whale shark with a maximum recorded body length being just over twelve and a half meters. 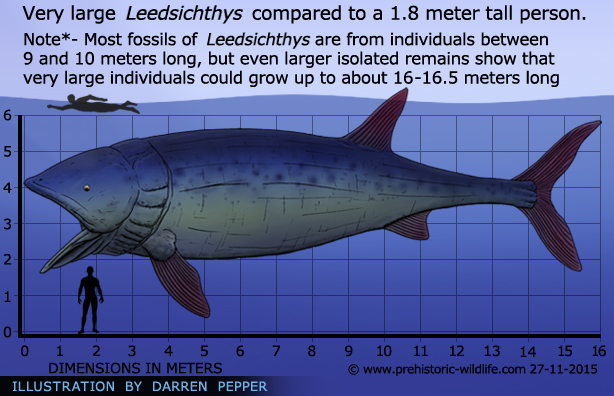 Some estimates have further pushed the maximum size of Leedsichthys to beyond twenty metres. 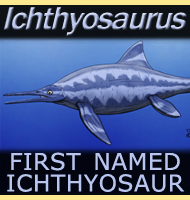 Leedsichthys has been named after Alfred Nicholson Leeds who first discovered it in 1886. 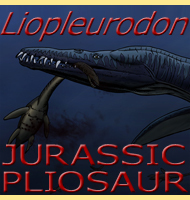 The type species L. problematicus was so named because of the difficulty involved in recovering and reconstructing the first specimen. 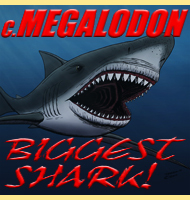 1 - Basilosaurus (whale), 2 - C. megalodon - lower average estimate (shark), 3 - Livyatan melvillei - lower estimate (whale), 4 - Pliosaurus funkei, a.k.a Predator X (pliosaur), 5 - Plesiosuchus (thalattosuchian), 6 - Thalattoarchon (ichthyosaur), 7 - Dunkleosteus (arthrodire placoderm), 8 - Shastasaurus (ichthyosaur), 9 - Tylosaurus (mosasaur), 10 - Leedsichthys - upper estimate (fish)), 11 - Brygmophyseter (whale), 12 - Rhizodus (lobe finned fish). 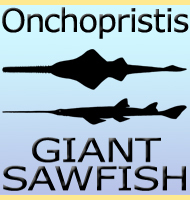 - Preliminary notes on some new and little-known British Jurassic fishes, Arthur Smith Woodward - 1889. 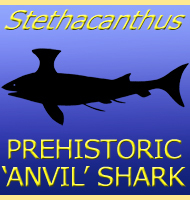 - The tail of the Jurassic fish Leedsichthys problematicus (Osteichthyes: Actinopterygii) collected by Alfred Nicholson Leeds - an example of the importance of historical records in palaeontology, J. J. Liston & L. F. Noe - 2004. - Homologies amongst the fragments: searching for synapomorphies in shattered skulls. In: Poyato-Ariza FJ (ed) Fourth International Meeting on Mesozoic Fishes - Systematics, Homology and Nomenclature, Extended Abstracts, J. J. Liston - 2005. 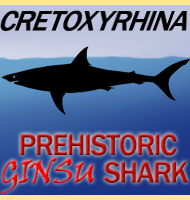 - Lured by the Rings: Growth structures in Leedsichthys. In: Poyato-Ariza FJ (ed) Fourth International Meeting on Mesozoic Fishes - Systematics, Homology and Nomenclature, Extended Abstracts., J. J. Liston, L. Steel & T. J. Challands - 2005.